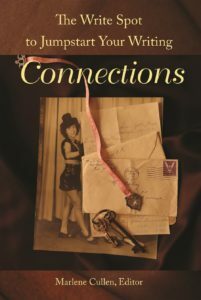 Even if you do not consider yourself a writer, Connections is an enjoyable escape. Reading a variety of short personal stories left me smiling, laughing, sighing, and contemplating. Editor Marlene Cullen cleverly includes over 25 authors with different writing styles in this anthology. At the end of each story there is a writing prompt, advice about life, and pictures of the authors when they were children, including some vintage photos. The section on Writing Resources includes details about freewrites, writing prompts, and websites for writers.